Sidney Robert Armitage was born in Nottingham on 23rd November 18942, the second son, third child of Stephen and Margaret (née Robinson) Armitage. In 1901, the family were living at Rock House, Epperstone, Notts3, except for Sidney's elder brother, Stephen Cecil Armitage (1889-1962) who was then boarding at Winkfield School in Winkfield, Berkshire4. Both Cecil and Sidney went on to Rugby School. By 1911, the family had moved to Beeston and was living at Broadgate House on Broadgate5. Stephen Armitage was the third son, one of fourteen children, of Samuel Fox Armitage (1830-1914) who, as a member of a Quaker family, had attended Bootham School, a Quaker boarding school in York. In turn, Stephen had attended the Ackworth School, a Quaker school, near Pontefract, Yorkshire. By 1869, Samuel had taken over the firm of Hutchinson & Armitage, a very successful Nottingham grocery enterprise. In 1890, he transferred the company to his sons, Wilson, Joseph John and Stephen Armitage who continued to develop it, particularly by their opening of quality café/restaurants in Nottingham - notably the Mikado Café on Long Row and the Oriental Café on Wheeler gate. In 1897, the company was floated as a public company as Armitage Brothers Limited.6. By the beginning of the Great War, both sons had begun their careers - Stephen Cecil as a solicitor with the Nottingham firm of Eking, Morris & Armitage and Sidney Robert as an accountant. Both immediately put these careers on hold, to serve with the colours. Both were commissioned with the Notts & Derby Army Service Corps, Stephen Cecil as a Captain and, Sidney Robert. initially as a Second Lieutenant. 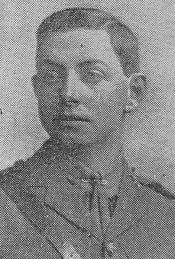 On 15 February 1915, Stephen Armitage died unexpectedly, aged only 50, at his home in Beeston7. Some five days earlier he had undergone an operation for appendicitis from which he was expected to make a full recovery. When he took a turn for the worse, both sons rushed home to his bedside, from Braintree, Essex where they were stationed awaiting transfer to France. So it was that, barely two weeks later, on 4 March 1915, Sidney embarked for France as part No 4 Company, 46th Divisional Train which was commanded by his brother. The Company quickly settled down to its daily, unending task. Division Trains, provided horse-drawn transport for a specific Division. Typically, it comprised a small Train Headquarters, a Headquarters Company, three other Horse Transport Companies and a contingent of other troops (known as Army Troops), all of the Army Service Corps. An officially approved Train could comprise up to 22 Officers and 337 men and would then occupy almost a mile of road when on the move in approved formation. It's vital task was to provide a supply line to the Division8. 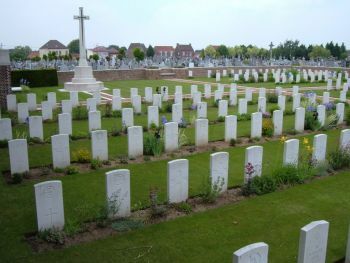 Mazingarbe Communal Cemetery and its extension are located in the Pas de Calais, in the small town of Mazingarbe, located between Lens and Bethune. Mazingarbe Communal Cemetery was used by units and field ambulances from June 1915 to February 1916. It contains 108 Commonwealth burials of the First World War and 24 French war graves. The extension was begun by the 16th (Irish) Division in April 1916 and continued in use until October 1918. It contains 248 Commonwealth burials of the First World War and two German graves.9. 6Lieutenant Armitage was posthumously awarded the Victory and British Medals and the 1915 Star. These were sent to his mother in November 1922, while she was living at College Hill House, Haselmere, Surrey10. She later returned to Beeston to live out her life with her two unmarried daughters, Elsie Margaret (1892-1974) and Hilda Winifred (1895-1981), at Cavendish Lodge, 10 Devonshire Avenue. She died at her home on 9 November 1938 with her funeral service at Beeston Parish Church, where she had been a devoted member during her lifetime11. She was interred in Nottingham Church Cemetery with her husband12. Hilda married Bernard Charles Webster at Beeston Parish Church, on 20 April 1939. Stephen Cecil Armitage survived the war, became a Director of Armitage Brothers Limited and took an active part in public life. He was Knighted in 1953, awarded the CBE, and was an Alderman and Honorary Freeman of the City of Nottingham. He died in 1962 and was survived by three children, Irene Margaret Dodd, Stephen Robert Armitage (1924-2010) and Lady Elizabeth Nivison. Cecil and Sidney also lost a cousin, Stanley Wilson Armitage, in the war. He enlisted in Birmingham with the King's Royal Rifle Corps, was offered a commission but preferred to stay in the ranks. After promotion to Corporal and arriving in France with the 9th Battalion, he was killed on the first day of the Battle of Loos, 25 September 1915. Sidney Robert Armitage is also remembered on the memorial in the chapel at Rugby School13. 31901 Census - Epperstone, Notts: Piece 3192 Folio 137. They employed a governess, a nurse and a cook. 51911 Census - Beeston, Notts: Piece 20430 RD429 SD3 ED5 Sched 307. Margaret's widowed mother, Mary A Robinson, was living with the family. They employed two servants. 7Nottingham Evening Post : 15 February 1915 and Nottingham Journal : 16 February 1915. His estate valued at £22,188 was proved at Nottingham on 24 February 1915 by his sons. Details of a typical Divisional Train are from The Long, Long Train website (www.1914-1918.net/what_divtrain.html) where more details may be found. 10Details of medals, embarkation date and mother's address in 1922 from Sidney's medal Card (on ancestry.com). 11Nottingham Journal : 10 November 1938 and 14 November 1938. 12Grave Number 9130 Rock Section. The memorial includes inscriptions for both Stephen and Margaret as well as their son, Sidney Robert.